Having grown up in Arkansas City, Samantha McClaflin found Cowley College to be an easy choice when selecting where to go after high school. Her decision turned out to be a wise one as she has flourished at the school and was recently named the College’s January Student of the Month. McClaflin is the daughter of Sam McClaflin and Kim Moss. She has one sister, Ashely Perry 24, and a brother, Sam 23. She graduated from Arkansas City High School in 2014. At ACHS, she was involved in SADD, the National Honor Society, Debate, and Forensics. At Cowley, she is a social work major and is involved in the IMPACT program and was previously a member of the ACES (Academic Civic Engagement through Service) organization as well as a Student Ambassador. McClaflin is a member of the Honor Roll, has a 3.6 grade point average, and has helped with food packaging events. 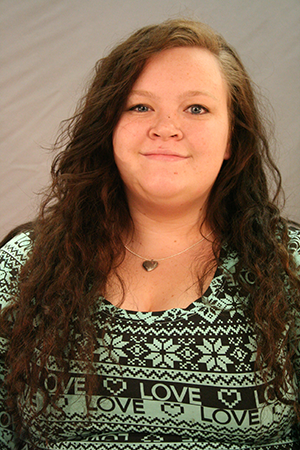 Away from Cowley she is employed as a CNA and Med Aid at Presbyterian Manor in Ark City. She also spends time tutoring her nephew, Andrew Perry. Despite her success and involvement in the classroom, McClaflin was surprised to learn she was selected as the January Student of the Month. After graduating from Cowley, McClaflin plans to transfer to Wichita State University to obtain a Bachelor’s degree in social work. “I hope to one day become a case worker and help children,” McClaflin said.